Fine adjustment carriage to control slider movement for precision measurements. Raised sliding surfaces for preventing defacement and wear of scale graduations. Four-way measurement capability for outer dimension (OD), inner dimension (ID), depth, and step measurements. 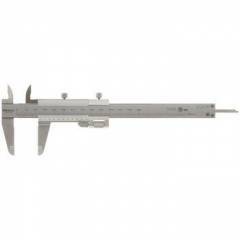 Mitutoyo 130mm Vernier Caliper with Fine Adjustment, 532-101 is a premium quality Calipers from Mitutoyo. Moglix is a well-known ecommerce platform for qualitative range of Calipers. All Mitutoyo 130mm Vernier Caliper with Fine Adjustment, 532-101 are manufactured by using quality assured material and advanced techniques, which make them up to the standard in this highly challenging field. The materials utilized to manufacture Mitutoyo 130mm Vernier Caliper with Fine Adjustment, 532-101, are sourced from the most reliable and official Calipers vendors, chosen after performing detailed market surveys. Thus, Mitutoyo products are widely acknowledged in the market for their high quality. We are dedicatedly involved in providing an excellent quality array of Mitutoyo Calipers.